I think I love cooking because both my mother and father loved cooking. The sweet and sour pickerel cheeks, the baked whitefish, the pickerel fillets, were all made with love. My father came in from the lake, cleaned the fish, filleted it, if the pickerel were big enough, cut out the cheeks. The whitefish usually came as a gift from someone fishing further north on Lake Winnipeg. They made the various pickerel dishes together but it was my mother who made the bread stuffing for the whitefish, then baked it. My parents were adventurous cooks. “Try this,” was part of their vocabulary. Fish livers, fish roe, beaver tale, moose burgers, venison chops, rabbit stew. Maybe that’s why tonight I decided that I’d see what I could make from the odds and ends in the fridge and freezer. I hate wasting food. It comes from my childhood. Some left over black beans. A half a lime. A part of a red pepper. A broccoli stem. A half a sweet onion. I put some white rice in my small frying pan. I’ve got so that I prefer using my small frying pan with a lid to using a pot to make rice. I let the rice partly cook, then spread the black beans on top. They were already cooked and just needed heating up. I squeezed the half lime over them, put the lid back and lowered the heat to less than 1. The black beans would have been fine for protein in the meal but when I checked the freezer, I found four prawns left in a bag. Thawed those out with warm water. Peeled and cut the broccoli stem in rounds, shredded the red pepper, chunked the sweet onion. It was all still pretty bland so I took two small hot pickled peppers out of half empty jar and threw those into the wok along with the veggies. Stir fried the veggies and peppers for a few minutes, then threw in the prawns. When the prawns were nearly done, put about half a cup of a sweet mango salsa from an open jar into the stir fry. 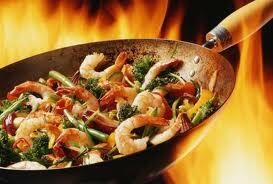 When the prawns were cooked, I tipped the wok over my plate and slid everything onto it. I added the rice with the beans and lime. My folks would have approved. The sweetness of the salsa with the heat of the peppers was delightful. Next time, though, I’ll put in four small hot pickled peppers. I like food that bites back. When I’m in Gimli, the heart of the heart of pickerel fillet country, I’ll make this and put it over the fillets. Or, I’ll make it with pickerel cheeks. No recipe. Just a sense of what goes together. The trick is not to cook the veggies too much. They need to stay crisp. Tomorrow’s supper? I dunno. Maybe beans on toast. Depends how lazy I’m feeling. However, I’ve got sort of a yen starting for Trinidadian curried chicken and I have four chicken thighs in the freezer. Alex Campbell brand. No growth hormones. No antibiotics. No arsenic. Just chicken. Let’s see. What will I need? Apples. Okay. Garlic. Okay. I’ll rummage through the fridge and cupboard. We’ll see how I feel about it tomorrow morning since it all should sit in a marinade during the day. I’m not talking about having one speciality such as barbecued steak that can be whipped up once a summer. I’m talking about lamb shoulder chops, sweet potato, onions, carrots, a bit of broccoli stem, simmered together for an easy supper for visitors. My mother always said if you want the kids to hang around, feed them. It’s great advice. Noses get anchored to delicious aromas, stomachs anticipate satisfying food. I’m talking about the attraction of Trinidad curried chicken steeping overnight in coconut milk, soya sauce, chilli pepper, salt, then fried the next afternoon in turmeric and curry and, when the chicken is falling off the bone, setting it aside in a warm oven while cooking chunky green pepper, apple, onions, celery in the curry gravy, then putting everything together in a welter of tastes and smells. Ladled over steaming rice, served with side dishes of chopped fresh fruit, dried raisins, almonds, cashews, this is a dish that is part of family lore, that is anticipated months in advance, that tantalizes the neighbourhood through the open windows. The windows are open, even in winter, because with a lot of people cooking, the kitchen heats up and fills with steam. This is a dish that requires a big plate with a nicely turned up edge to hold everything. What’s particularly good about it for feeding visitors is that it can be prepared the previous day. Beer, tea or yogurt drinks wash it down well. For years I’ve made Trinidad curried chicken for Christmas Eve. Non-traditional food for the Eve and a traditional Christmas dinner at my daughter’s for the Day. My daughter and her husband are both good cooks. Their tables groans with turkey, sweet and white potatoes, gravy, vegetables of many kinds, condiments, stuffing,all followed by homemade pie, cookies, slices. However, there are empty places at the festive table now for my son in law’s parents are gone. My parents are gone. There are friends who used to join us who are no longer here. Yet, when we raise a glass or a fork, it is with happy memories from meals gone by. We’ve all grown older. That affects both the cooking and the eating. When my daughter now says, “I’ve got three kinds of pie. What would you like?” we used to say, “Yes.” No one says “Yes” anymore to all three. There was a time when we could eat ice cream pumpkin pie, pecan pie and apple pie and never put on a pound. My mother was a wonderful cook. My father was a good and inventive cook. When you grow up with people who love to cook, it is hard not to delight in the selecting, the preparation, the cooking, the serving of food. My mother made lemon pie with love. When my father married her at the age of twenty, he said, “I’m going to have lemon pie every day.” He didn’t eat lemon pie every day but we ate it often, crisp, flaky crust, deep lemon, high meringue slightly toasted on top. When we were playing or working outdoors and it came close to coffee time and we could smell the lemon faintly on the air, we licked our lips in anticipation. Love is as important to cooking as butter. You don’t find it listed in the recipe book because it is understood that good food requires love. Two tablespoons flour, one tablespoon butter, two tablespoons of love. Love gives you a dozen raisin tarts with a crust that crumbles in your mouth. When you bite into the sweet richness what are you tasting but love? Good family cooking ruined me, of course. I’m not just talking about my waist line. My doctor says eight pounds have to come off. It’s a struggle. However, good family cooking also ruined me for restaurants and prepared foods. I try restaurants but then sit there fiddling with a meal I wouldn’t serve or eat at home. I buy convenience food from the store freezer but seldom buy it twice. I don’t find it convenient to eat food that offers nothing but convenience. We often talk about great meals we’ve shared. Less often, we talk about great meals we’ve prepared together. Yet, the choosing of the menu, the shopping, the preparation of the food, the cooking, done together creates a team, brings people together in a happy task, gives everyone a stake in the banquet set before usl. Food isn’t just for eating. It is also one of the ties that bind family and friends. During this holiday season, or any holiday season, give your children and grandchildren a gift that will serve them the rest of their lives. Get them to help in the kitchen. Give them a chance to say, “I cooked the broccoli.” Or, “I helped make the rice pudding. “ or the stuffing or salad. 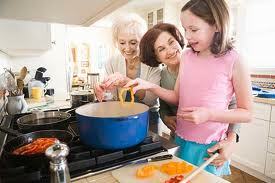 Make helping in the kitchen it fun. Don’t worry about the mess. 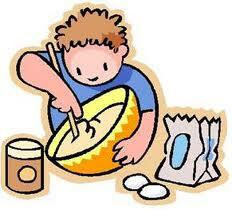 Start kids with something simple and quick, something that they’ll want to eat. If you are making pastry, make sure you have some left over and let them roll it up with cinnamon and butter and brown sugar. Cut the roll into pieces and pop them into the oven on a cookie sheet. When the pastry is ready, share some with them with a glass of cold milk and find something to laugh about. Love and laughter go together. Take them shopping to the grocery store, not for a humungous cart full of groceries, but for some of the amazing variety of Chinese vegetables you can find nowadays. Buy enough for a stir fry, then leave. If you don’t own a wok, go buy one. Get them to help you to discover what you should do with mo qua or daikon. Solve the mystery of bok choy. Make the mysterious familiar. Food is a mystery waiting to be revealed. It wasn’t until I was married that I was introduced to the taste of kippers, green peppers and mangoes. I introduced my wife to pickerel cheeks with sweet and sour sauce, holopchi, skyr with strawberries. Not all experiments work out. Keep some shepherd’s pie in the freezer. There’s nothing wrong with homemade shepherd’s pie and catsup. If nothing else, you can always whip up toasted cheese and bacon sandwiches served with fresh fruit. This is Canada. Our neighbours and often our relatives by marriage come from the four corners of the earth. Ask them to make an ethnic dish. At one time, we had a Ukrainian neighbour. We started some festive meals with kutya (boiled wheat and honey) and ended with Icelandic vinarterta (a seven layer torte a prune filling).